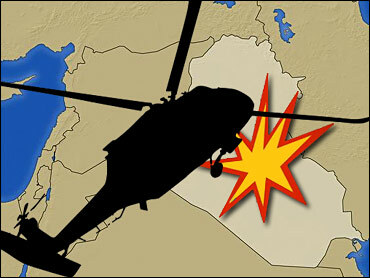 A U.S. military helicopter crashed Tuesday southeast of Baghdad, killing two soldiers and injuring 12, the U.S. military said. Initial reports indicated the crash was not due to hostile fire, the military said. The statement also did not specify the type of helicopter or the nationalities of the victims. The crash occurred near Salman Pak on the outskirts of the capital, a military statement said. "An investigation will be conducted to determine the cause of the incident," the statement said. "However, initial reports indicate the crash was not the result of enemy fire." Meanwhile, an al Qaeda-linked militant group claimed responsibility for a series of attacks it says it had launched in northern Iraq, including a suicide bombing last week that killed six people and seriously wounded a top Kurdish policeman in the city of Kirkuk. The claims coincided with comments made Monday by a senior U.S. commander that northern Iraq has become more violent than other regions in Iraq as al Qaeda and other militant groups move there to avoid coalition operations elsewhere. Army Maj. Gen. Mark P. Hertling, the U.S. commander in northern Iraq, told Pentagon reporters that al Qaeda cells still operate in all the key cities in northern Iraq. Militants have been pushed east to his area from Anbar after local tribes have allied with U.S. forces against al Qaeda, he said. Others have been pushed north from the Baghdad region, where this year's U.S. troops escalation has made more operations possible, he said. Ansar al-Sunnah identified the Kurdish policeman in Kirkuk as Brig. Gen. Khattab Omar, saying he was the commander of the police's "Quick Response Force" in the city. It said eight of his guards were killed in the suicide car bombing. Police in Kirkuk, 180 miles north of Baghdad, have said a suicide bomber rammed his car into a police patrol Nov. 15, killing six people and wounding more than 20 - many of them children walking to school. They said the bomber's apparent target was Omar's six-car convoy. Three of the commander's officers were killed, along with three civilians, they said, but the commander survived with serious injuries to his chest and head. Kirkuk has been seeing a spike in violence in recent weeks as tensions rise between the city's Kurdish, Arab and Turkomen communities ahead of a possible referendum to decide the fate of the region. Iraq's Kurds claim the city as their own and want to annex it to their self-rule region, but Kikruk's Arab and Turkomen - ethnic Turks - dispute the Kurdish claim. In another attack in Tikrit, Ansar al-Sunnah said it had used a "unique and unparalleled" technique when it bombed a police station Sunday by using a roadside bomb buried in a fake device. It gave no further details, but police in the city said a policeman was killed and two others, including a lieutenant colonel, when they tried to defuse a roadside bomb they took inside the city's police forensic laboratory after retrieving it from the street outside. In other claims, the militant group said it tried but failed to kill with a roadside bomb an Iraqi officer working at the joint U.S.-Iraqi command in Tikrit. It did not say when the attack took place or give casualty figures, saying only that while the target escaped, the explosion filled "soldiers of evil" with horror and fear. In Mosul, it said its fighters on Nov. 4 attacked the headquarters of the city's "Awakening Council" - the name given to the command of tribal forces which joined the U.S. and Iraqi forces in the fight against al Qaeda. It gave no details. Iran is accepting an offer for continued talks with the United States on Iraqi security, with the state IRNA news agency saying Tuesday that Foreign Minister Manouchehr Mottaki welcomed a fourth round of discussions. "Iran will give a positive response to this request," Mottaki was quoted as saying by IRNA, adding that the talks will be held "in the near future." The U.S. military plans to seek a criminal case in an Iraqi court against an award-winning Associated Press photographer but is refusing to disclose what evidence or accusations would be presented. An AP attorney is strongly protesting the decision, calling the U.S. military plans a "sham of due process." The journalist, Bilal Hussein, has already been imprisoned without charges for more than 19 months. Iraqi Foreign Minister Hoshyar Zebari said Tuesday the threat of a major Turkish military incursion into northern Iraq was less likely due to increased cooperation between Ankara and Baghdad to curb Kurdish rebel attacks against Turkish forces. "The threat is still there but we believe the chances of a major invasion are less now," Zebari said, ahead of talks with EU foreign policy chief Javier Solana in Belgium. Sporadic violence nationwide left at least 22 people were killed or found dead Monday. The deadliest attack occurred near the southern city of Basra when a rocket slammed into a house, killing five children and their mother, police said. Police said they believe the rocket was targeting the nearby airport, which is the headquarters of the British military in the area, but fell short. Meanwhile, the Iraqi military took a hard stance Tuesday against 33 foreigners and 10 Iraqis detained after a shooting involving their convoy run by a U.S.-contracted firm in Baghdad, saying they were accused of opening fire randomly and wounding an Iraqi woman. The U.S. military said that the convoy belonged to Almco Group, an Iraqi-run company that has contracts with U.S.-led forces, but that it was unclear if those detained were operating under the auspices of those contracts or others when the shooting occurred Monday. "We are steadfastly against any security company that behaves recklessly when it comes to the lives of Iraqis or the violation of Iraqi laws," said Brig. Gen. Qassim al-Moussawi, an Iraqi military spokesman in Baghdad. Monday's incident follows a series of recent shootings in which foreign security guards allegedly have killed Iraqis. Last month, the Iraqi Cabinet sent parliament a bill to lift immunity for foreign private security companies that has been in effect since the U.S. occupation began in 2003. Maj. Brad Leighton, a U.S. military spokesman in Baghdad, said Almco, based in Dubai, United Arab Emirates, has contracts with U.S.-led forces to provide food, water and other life support functions to military transition teams, as well as the construction of a justice compound. But he said it was not yet determined whether those detained were working on those contracts at the time of the incident. "They may have been working for another contract at the time that they were detained," Leighton said. Almco officials did not immediately respond to requests for comment.